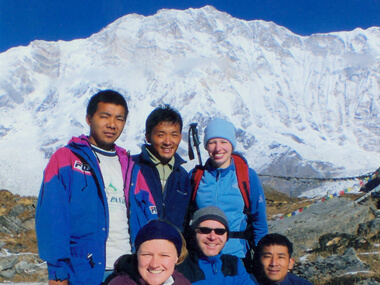 Annapurna Base Camp trekking is also known as Annapurna Sanctuary trekking. Annapurna Base Camp trek is one of the most popular and spectacular trekking trails in Nepal. Although it has some steep climbs in trekking trail, Annapurna Sanctuary trekking is not difficult. We start Annapurna Base Camp trekking from Phedi and end in Nayapul. During trekking days trekkers enjoy spectacular mountain scenery with incredible cultural diversity. They pass through rural farms and villages, variety of terrain and to glaciers. It is more distinct than any other treks by its multi ethnic villages, their rich culture, beautiful landscape and natural scenery. Annapurna Base Camp trekking is a good introductory route for close encounters with the Himalayas in a short period of time. From the Annapurna Base Camp trekking trail you will have a close up look of Dhaulagiri (8167m), Nilgiri (7041m), Fishtail or Machhapuchhare (6998m,) mount Annapurna I (8091m), mount Annapurna (II 7939m), mount Annapurna III (7555m), mount Annapurna IV (7525m), mount Annapurna south (7219m), mount Himchuli (6441m), Lamjung Himal (6986m),Tukuche peak (6920m) etc. Early in the morning, transfer to pokhara bus station & drive seven hours to Pokhara, check in at hotel and evening Phew lake exploration. After breakfast, we take 45 minutes drive to Suikhet Phedi (1130m), where our trekking crews will be waiting for us. Then we start the trek ascending the trial, from here the path diverts and climbs the ridge above the Yangri Stream and reaches the village of Astam at the top of the ridge. Follow the ridge west through the Henjakot & reach to Dhampus, from here one can have a closer view of Mt. Machhapuchre & Annapurna South. Over night stay lodge. we start the trek & ascend up for an hour through the dense forest of Rhododendron & Orchid to a Pass at 2160 m then descend gradually for another an hour to reach Ghatte Khola for lunch. Then continue the slope downhill to Landrung. . Over night stay at lodge. The first village you can be at Landruk (1646m), a typical Gurung (out of ethnical group) community. High on the opposite side of the river, you can explore the village of Ghandruk . From this point, the trial descends along terraced slopes & forest down to the river. After crossing the river at New Bridge, your trial moves to steep ascend 500m and join with the trial from Ghandruk.From here it is a short & fairly walk to Chomrong (2000m).Chomrong is a village which offers a spectacular views of Annapurna south & Machhapuchhre. . Over night stay at lodge. The trail descends via a stone staircase, eventually crossing the Chhomrung Khola. Participants climb high above the Modi Khola, traveling its west bank, and pass through forests of bamboo, rhododendron and oak. This portion of the day’s trek is followed by yet another ascent to Kuldi before finally descending a long, steep, stone staircase to Dovan. We stay overnight at Dovan at lodge. Overnight stay at guesthouse. You ascend and descend as your route opens up new trails. On climbing steeply for a while, you approach Hinku Cave . This course follows zigzag paths of stones. After walking for 3 to 4 hours, you enter the Annapurna circuit Sanctuary, a huge amphitheater enclosed by a solid wall of snow-capped peaks which include Annapurna I, the fish tail spire of Machhapuchhare. Finally, you will find yourself at Machhapuchhare Base Camp, a grassy moraine platform. You can take rest at one of the lodges, and treat yourself with hygienic food. Overnight stay at guesthouse with breakfast, lunch and dinner included with Tea and Coffee.Trek to Annapurna South base camp. The trail remains on the west bank of the Modi, now flowing through a more open valley, and eventually emerges into the Sanctuary. The route begins on a broad grassy path, before climbing over lateral moraine and down to the beautiful ablation valley. 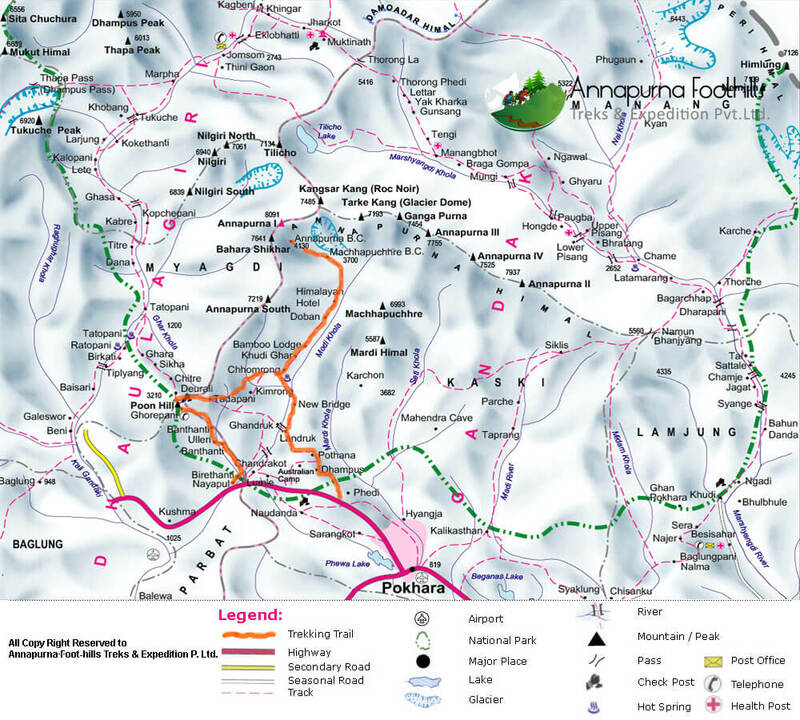 We soon reach the British Expedition Annapurna South Face Base Camp (4234m.) We either camp here or continue North West , staying above the glacial moraine. Overnight stay at guesthouse. Descend and follow the same route to a pleasant camp spot at Dovan, which lies on the boundary of the Sanctuary. Overnight stay at guesthouse. Descend a long, stone staircase through bamboo and rhododendrons forests to Kuldi. The trek continues through beautiful rhododendron forests and down to Sinuwa. From Sinuwa, the trail leads downhill to the Modi Khola, closing the day with a steep climb to Chhomrung. Overnight stay at guesthouse. An hour climb from Ghorepani, you can reach at Poonhill (3200m) from where you can explore beautiful mountains such as Dhaulagiri, Nilgiri, Annapurna I & Annapurna south. It is best at dawn. After returning from Poonhill, you descend to Hile is small Gurung Village. From Hile 3 hours walk Nayapul and drive to Pokhara, then driving to Pokhara for an hour by private vehicle. We have short and easy walking on this day. Overnight stay at Hotel with breakfast included. Your sightseeing trip will start at 9AM in the morning after breakfast. Places we visit are Fewa Lake , Devis water fall, Museum, and Gupteshower cave. You will have relaxing afternoon. Overnight stay at hotel with breakfast included. .
18 Sight seeing in Kathmandu.